I listen to audio through headphones for a large portion of my day and I have done so for many years. I am sure other people around my age are the same way. Traditionally, I had only used in-ear headphones but when I moved into a new home office, I decided to try some over-ear headphones specifically for use around the flat. I’d continue to keep using my in-ear headphones for use outdoors or in public places. I decided to get some fairly cheap Sony Bluetooth headphones (DR-BTN200M) to see if this design worked for me. Generally, I was really happy with the style of headphone, but I decided it was time to invest in something a bit more substantial. I spent a lot of time looking around at the various options in the market and a month ago I settled on the Sony MDR-100ABN h.ear on Wireless Over-Ear Headphones with Noise Cancellation in Charcoal Black. Compared to my previous headphones, the MDR-100ABN has a larger earpads that are made with better materials. The top part of the band also includes an area with this same padding – which is most welcome for people like myself who do not have too much padding of our own on top. The metal construction makes them heavier than my previous headphones, but I have found the weight is not an issue for me and I am able to wear them for hours without discomfort. As I use them at home, I did not need to go for the smaller in-ear style headphone I have primarily used for years. Having a larger device means there is plenty of room for the battery. It lasts a long time on a full charge – though I will freely admit I have not taken the effort to time how long it takes for them to run down to empty. They just seem to work for multiple days when I need them to, so I am happy with this. Even if the battery runs out, it doesn’t matter since a standard 3.5 mm audio cable can be used in place of Bluetooth. This was something I knew I wanted and was a factor in choosing this model. It means that I can travel with these headphones safe in the knowledge that I can still use them without access to a power socket. My only complaint is that it does not seem to implement Bluetooth multipoint. According to the instructions, you can pair it with multiple devices, but it does not support simultaneous connections like other Bluetooth headsets do. This is not a deal-breaker for me, but it I would have appreciated it. Bluetooth connectivity means I can use them with my Surface while I am at my desk without worrying about being tangled up in cables. Being able to walk from my desk to the kitchen without unplugging helps me stay focused on the task. In fact, the Bluetooth connection will go from my office to every other room in my flat. Bluetooth isn’t perfect though, as the further away from my office I go the more likely it is that the audio will break up. Breaking up over long distances is pretty normal though, so I’m quite happy with the performance in this regard. I do not think I have the correct vocabulary to offer an expert assessment of the audio quality on the MDR-100ABN headphones. Nor do I have I have access to any other contemporary headphones in order to form a fair comparison… but they sound excellent to me! They certainly have a better sound than my previous over-ear headphones and my current in-ear headphones. The fact they have fantastic noise isolation also seems to improve the general quality. I often see users of more traditional earphones put the volume really high in order to cover the sound of their environment – but this can result in audio distortion and damage to hearing. Since my first pair of isolating in-ear headphones, I have understood the value of blocking out external noise so that the music can be enjoyed without distraction while still being used at lower volumes. This time I wanted more than noise isolation, I wanted to have the option of active noise cancellation too – so I only considered headphones with the feature included. The MDR-100ABN’s large earpads isolate a good amount of external noise, and then microphones on the outside of the cups then record the external environment which in turn is processed so that it can cancel out the sound waves going into your ear. 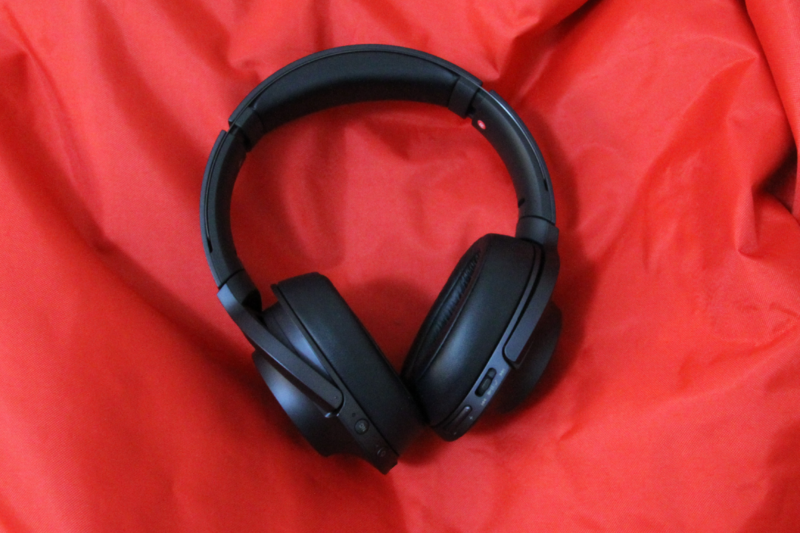 The effect here is extremely good and I can use the MDR-100ABN to listen to music on relatively low volumes without hearing background noise like fans, air conditioning, washing machines, or even neighbours watching TV or talking loudly. I already live in a fairly quiet place, but one of the side effects is that even the faintest noise, like doors shutting or cars parking, can become a distraction. All of that is gone when using these MDR-100ABN’s active noise cancellation, even without playing music. 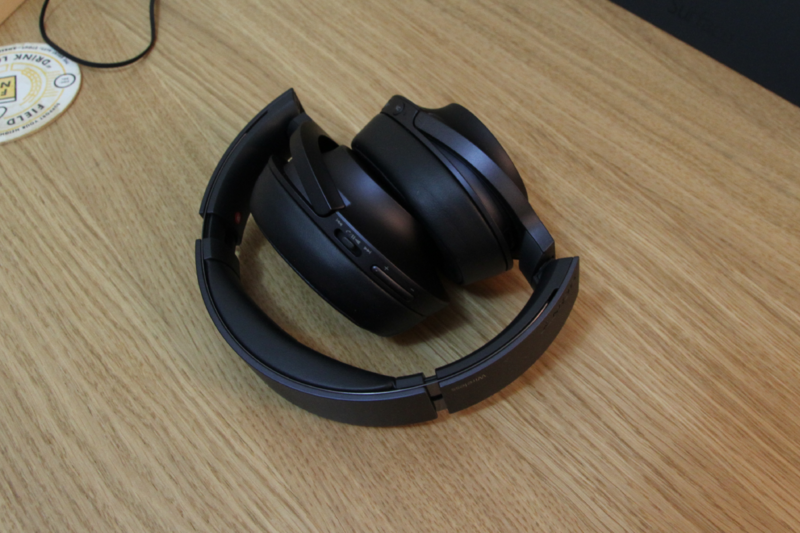 The Sony MDR-100ABN are fantastic headphones and I’m really pleased I have them and the two year warranty means I can be sure that they’ll last. 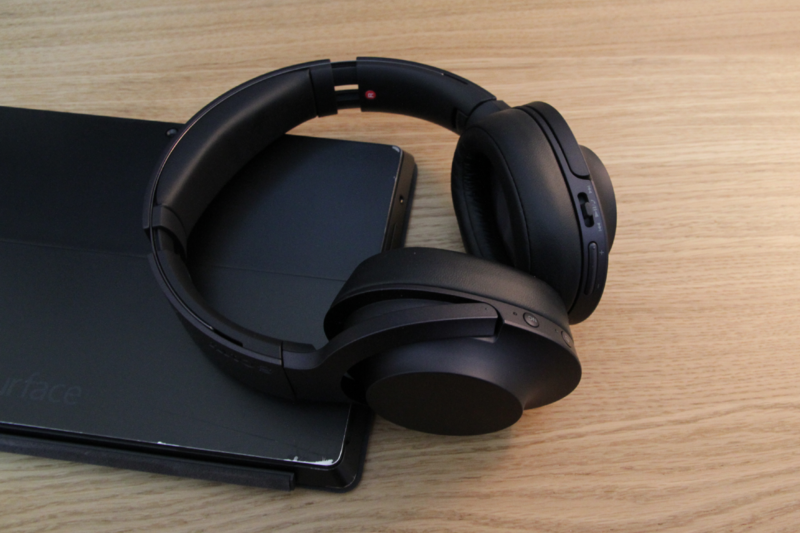 They are perfect for use at home when writing software and the noise cancellation works well with my favourite productivity music as a way to reduce distractions and stay comfortable for hours. That is why I got these headphones, and they fit the purpose well. It’s worth mentioning that I will continue to use in-ear headphones for outdoor use; I do feel comfortable using the MDR-100ABN while walking around in public, even though Sony show people using them this way in their advertising material. I may change my mind over time, but until then I still need to have at least one other set of earphones for use in other scenarios. Right now, the reality is that I have two additional sets of in-ear headphones that I use regularly with my phone – wired and wireless – bringing my total count of headphones in regular use to three. I will certainly be looking towards having similar noise cancelling features for my smaller headphones in the future and the minimalist in me would love to consolidate them even further… but I don’t think the technology is really where I want it to be. Most in-ear noise cancelling headphones require an external processing unit, which makes them less portable in general. I believe we’re actually on the cusp of a number of cool audio technologies and I hope to see tiny in-ear devices with real time audio processing and noise cancelling built in. I can imagine having a system like this with spatially aware audio and the ability to move between sources securely and seamlessly… but we’re clearly still a number of years away. Until then, I will stick to my three sets of headphones, with the MDR-100ABN as my favourite of the bunch, even if I only use them at home. I would sometimes like to use the Sony MDR-100ABN headphones with noise cancelling on but without music. Can I just turn on noise cancelling without listening to music?